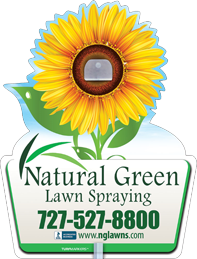 Natural Green Lawn Spraying provides a range of monthly plans for your lawn and landscaping. We customize our program based on your individual needs. If you want to keep your Pinellas County lawn looking its best, contact us about one of our programs or to find out more about our services. Natural Green Lawn Spraying provides a complete lawn program with multiple treatments per year to ensure weed and pest control. These treatments keep your lawn looking healthy and beautiful while preventing diseases that can ruin your landscaping. Our lawn care program consists of several elements that are adjusted to meet your lawn’s needs and your budget. We can take care of specific pest problems or provide overall protection of your property. Caring for shrubs can be a time-consuming task, which is why Natural Green Lawn Spraying takes care of the work for you. We fertilize and protect your shrubs to ensure that they always look healthy and provide you with many years of enjoyment. We remove pests that can cause healthy plants to become sickly and even die. When you choose Natural Green Lawn Spraying you enjoy the benefit of hiring professional staff who have been trained in disease and pest control. We have seen all kinds of diseases and problems that can damage your lawn and impact the health of your plants. You can trust us to provide exceptional care for your lawn and all of the plants you proudly display. In addition to protecting your lawn and keeping it healthy, having a professional lawn care company like Natural Green Lawn Spraying treating your lawn protects you, your family and your pets. Insects such as fleas, ticks and fire ants can become a pest problem on your lawn. As their population grows, these pests can transfer to your pets and invade your home or cause illness to you and your family and pets. Natural Green provides a natural treatment on your lawn to remove these insects and prevent their reappearance so your family can feel safe whether inside or playing outside in the yard. Let us help you keep your property healthy and beautiful with professional care. Contact us today to schedule a free yard analysis with no obligation.